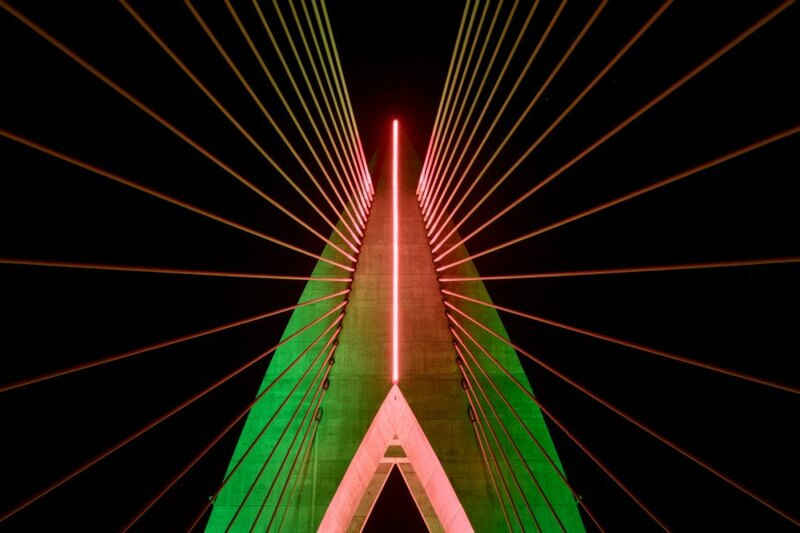 Morocco recently celebrated the completion of the longest cable-stayed bridge in Africa, the Mohammed VI Bridge outside the country’s capital city of Rabat. 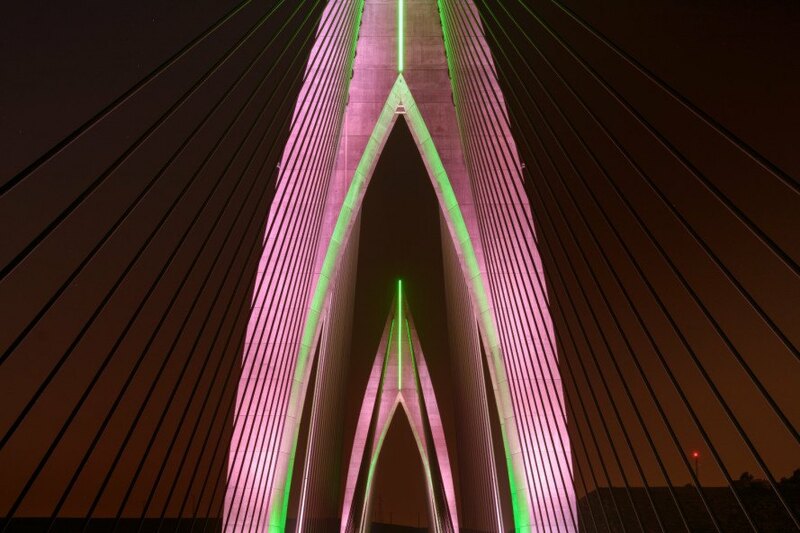 The bridge, which pays homage to the King of Morocco, has become an iconic new landmark, thanks in part to Philips LED lighting which adorns the length of the bridge. The bridge’s operators can choose from 16 million colors or create a fantastic light show, all while operating at a cost effective level of energy efficiency. 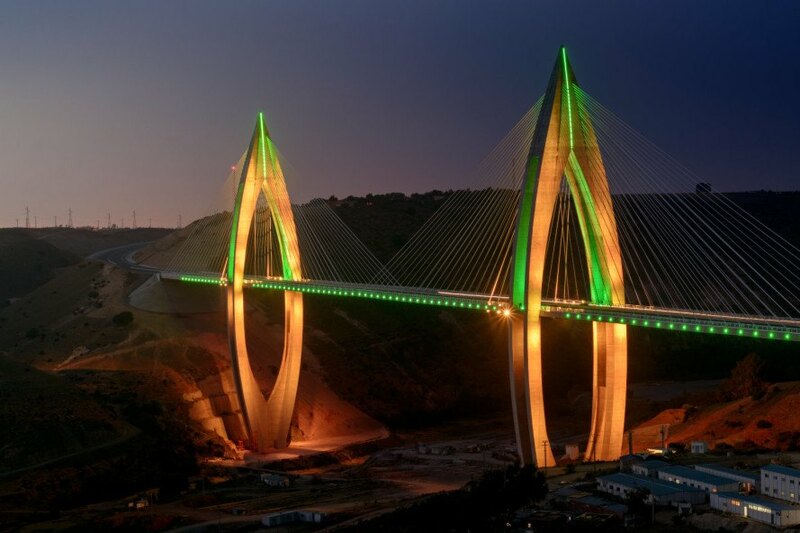 The Mohammed VI Bridge was inaugurated just two weeks ago by its namesake. The bridge spans a section of desert connecting Rabat to the city of Salé with 3,116 feet (950 meters) of roadway, making it the longest bridge of its kind on the African continent. The bridge carries six lanes of vehicle traffic and spans between two 650-foot (200-meter) tall towers. Some 160 cables lend strength to the bridge as well, and provide the perfect support for the Philips LED lighting system that illuminates the bridge’s cables and pillars high above the roadway. The futuristic lighting system employs Philips Color Kinetics technology. It allows bridge officials to change up to 16 million colors and can be programmed to display elaborate light shows. In addition to the wow factor of the sight of the illuminated bridge, the LED lighting system can keep costs under control, operating at a level up to 75 percent more energy efficient other existing lighting systems. PARABENS, UMA VERDADEIRA OBRA DE ARTE, COM ILUMINACAO FANTASTICA, TECNOLOGIA DO FUTURO! Some 160 cables lend strength to the bridge as well, and provide the perfect support for the Philips LED lighting system that illuminates the bridge’s cables and pillars high above the roadway. It allows bridge officials to change up to 16 million colors and can be programmed to display elaborate light shows. The futuristic lighting system employs Philips Color Kinetics technology. In addition to the wow factor of the sight of the illuminated bridge, the LED lighting system can keep costs under control, operating at a level up to 75 percent more energy efficient other existing lighting systems. The bridge carries six lanes of vehicle traffic and spans between two 650-foot (200-meter) tall towers. The Mohammed VI Bridge was inaugurated just two weeks ago by its namesake. The bridge spans a section of desert connecting Rabat to the city of Salé with 3,116 feet (950 meters) of roadway, making it the longest bridge of its kind on the African continent.